In Ribčev Laz near Lake Bohinj there is a model of Triglav, the highest mountain in Slovenia. Made of stones, it is the work of the painter Valentin Hodnik from Bohinj. Although it is a work of art, we wanted to evaluate the correctness of its shape compared to the actual mountain. We photographed it and created a point cloud model using the Structure from Motion process (SfM). 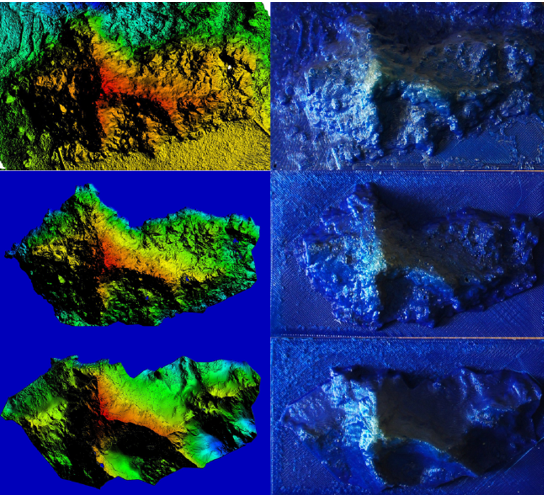 By transforming the point cloud to actual size, we were able to compare it with the actual shape of the Triglav mountain range obtained from Laser Scanning of Slovenia (LSS). As expected, the shape of the model varied considerably from the actual shape of the mountain, and the scale of the individual slopes and ridges was not the same. For a qualitative evaluation of the model, we calculated the distances between the transformed model and actual surface. The average absolute distance between the nearest points in both point clouds was 41.8 m (6 cm at a built-model scale) with a standard deviation of 38.0 m (5.4 cm). The results are represented by a picture of absolute distances. We also produced a smaller 3D print of the Triglav model and the actual shape of the mountain.